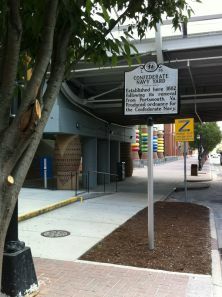 Established here 1862 following its removal from Portsmouth, Va. Produced ordnance for the Confederate Navy. It is improbable that a navy yard should have been located in the center of Charlotte but therein lies a tale. 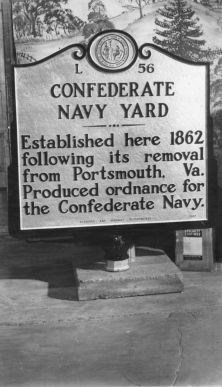 In March 1862, Gosport Yard, a Confederate Navy Yard in Norfolk, was at risk of being captured by Union forces. After the battle of the USS Monitor and CSS Merrimac in which the Merrimac was lost, Confederate officials knew that, unless they wanted to have all of their property confiscated by the Union, they would have to move the naval yard. Upon the recommendations of Captains William H. Murdaugh and William Parker, the Confederacy moved the operations and machinery of Gosport Yard to Charlotte. The city appealed to Confederate leaders owing to its location 200 miles from the ocean keeping it far out of reach of the Union Navy. Also, given its location along the North Carolina Railroad and the South Carolina Railroad, it was connected to several seaboard cities, enabling it to transport necessary products to the Confederate Navy. Among the buildings constructed on the site of the new naval yard were a gun carriage shop, a torpedo shop, and a large forge shop where the largest steam hammer in the South operated. By May 1862, the Charlotte Navy Yard was open for production. Captain H. Ashton Ramsey was chief engineer over approximately 1,500 men, hailing from Mecklenburg County and from the Norfolk area. Products of the yard included marine engines, rifle shells, torpedoes, gun carriages, solid shot, heavy forgings, and projectiles. An employee named Thomas Dwyer built a machine that made perfectly round spheres, improving the production of cannonballs and the marksmanship of the Confederate artillery. Until November 1864, the Charlotte Naval Yard experienced fewer effects of the war than any other navy yard. In time it began to encounter difficulty obtaining and retaining trained workers. Production was significantly stunted because of this shortage of labor. Closer to the end of the war, when Gen. George Stoneman and his troops were marching through North Carolina, Captain Ramsey was given 300 muskets and ordered to form three companies of men from the yard employees. At that point the tools and machinery from the yard were moved from Charlotte to Lincolnton. Before the yard could be reassembled and activated in Lincolnton, the war ended. After the war the yard’s previous landowner, Colonel John Wilkes, repossessed the property, for which the Confederate government had never paid him. Where the Confederate Navy Yard once operated, he established Mecklenburg Iron Works. It operated from 1865 until 1875 when it burned. Later it was rebuilt and became Seaboard Airline Railway’s freight station. That building was razed in 1959.